With the temperatures climbing above 40 degrees Celsius a large number of people are buying air conditioners to stay cool keep the blistering heat at bay. 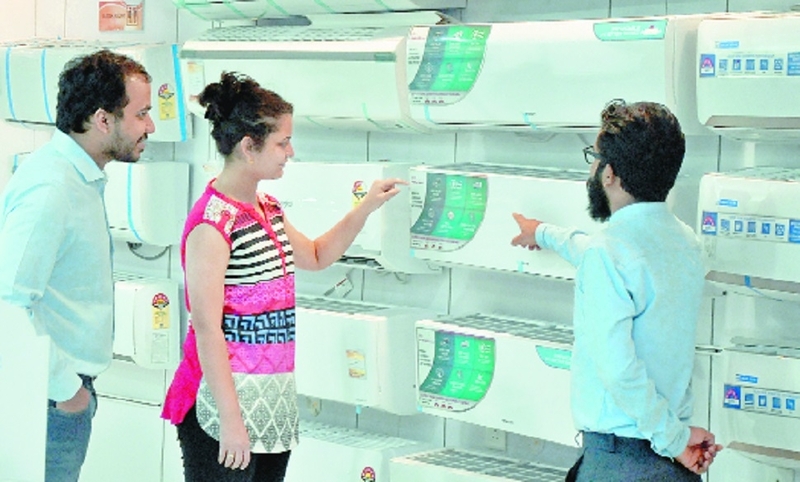 Many electronic showrooms in the city are witnessing a surge in demand for air conditioners due to intense heat. “The demand for air conditioners has picked up from the month of March and we are seeing a rise in demand by more than 25 per cent compared to last year,” said Nihar Taori, Director of Taori Marketing situated at Dharampeth while speaking to The Hitavada. Another factor which is pushing growth in demand for air conditioners (ACs) is due to the flexible finance schemes introduced by consumer finance companies. These companies have made it easier for consumers to buy air conditioners by offering zero down payment, zero interest and choosing the amount of EMI that consumer wants to pay. Similarly, consumer finance companies are giving cash back offers in addition to dealers discount. He said that consumer preferences have shifted more towards air conditioners now-a-days compared to desert coolers and room coolers due to environmental concerns such as water scarcity. Apart from this, consumers want to cooling convenience without paying high energy bills. Air conditioner manufacturers have introduced revolutionary energy saving inverter technology to match consumer requirement. With the use of this technology, the consumers can save more than 30 per cent on their energy bills. “Air conditioner is no longer considered a luxury product but has become a necessity and part of our daily life,” he said. According to Taori, the most sought after air conditioner brands are Mitsubishi, Voltas, LG, Panasonic, Carrier, Hairer, Blue Star, Daikin, Hitachi, Godrej, O General etc. The most preferred air conditioners are the 1 tonne and 1.5 tonne. There are also 3 Star and 5 Star energy saving category air conditioners. The price range starts from Rs 30,000 to Rs 40,000 for the medium segment range. The premium range begins from Rs 40,000 to Rs Rs 60,000, Taori added. In Vidarbha, 65,000 units are sold during the year. This is much lower than Mumbai with 2.5 lakh to 3 lakh units being sold and Pune with 1.25 lakh units sold during the year, he added. Another leading AC dealer, Gaurav Pahwa, Director of Lotus Electronics said that his stores are witnessing a rise in demand of 25 per cent compared to the previous year. Generally the demand for air conditioners starts from January or February. But this year has been an exception as the mercury started to increase from March. “We are expecting the hot weather to continue till June end and demand to go up during this period,” he said. According to A K Gandhi, Director of A K Gandhi Marketing the demand has swelled by 25 per cent as compared to the previous year. “The overall response for air conditioners is tremendous this year. The revolutionary energy saving inverter technology has positively impacted demand. Buying an air conditioner has become more affordable,” he pointed out. Gandhi said that there has been a shift in consumer spending. Many consumers are upgrading their old air conditioners and buying ones equipped with latest inverter technology. Along with this, a new trend has set in with consumers buying more than one air conditioner. Some consumers are installing air conditioners not only in the living room but also in every bed room. “The demand for inverter technology air conditioners is so high that some manufacturers produce air conditioners equipped with inverter technology,” Gandhi said. The split and window air conditioners are being phased out as the demand has come down substantially, he added.